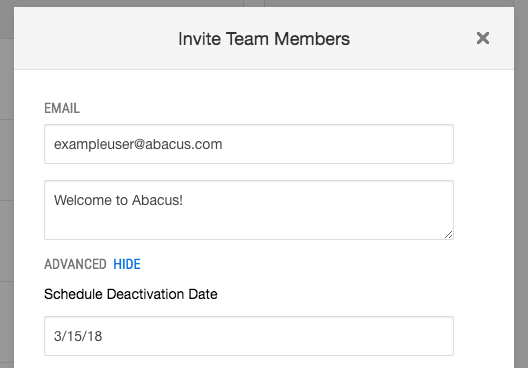 To invite people to your company's Abacus account, you'll need to send out a unique invitation so that person can join the official company account. This could be employees, accountants or outside contractors. Each user will receive an email invitation and must use the link in the email to join the company account. 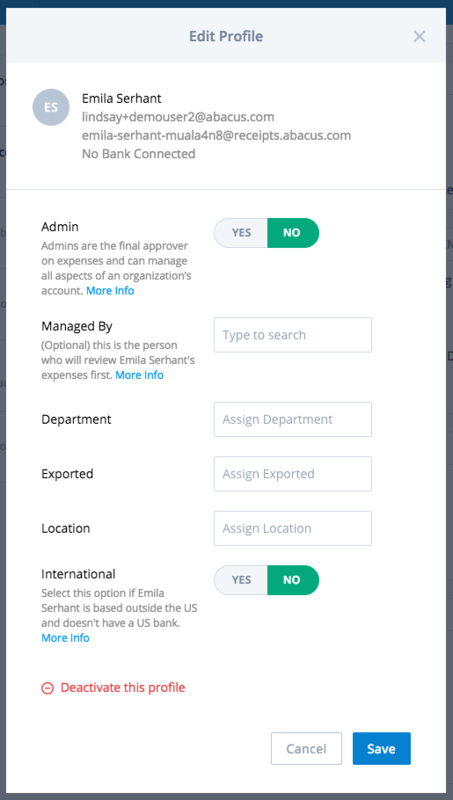 Click on the "Admin" tab in the top left hand corner of the navigation bar to access your company account, and then click on the "People" section in the navigation bar directly beneath the "Team Cards" section. Once you are in the "People" section, click on the blue "Invite Team Members" icon in the top right corner of the blue top bar. This will prompt you to type in the user's email and add an optional note. 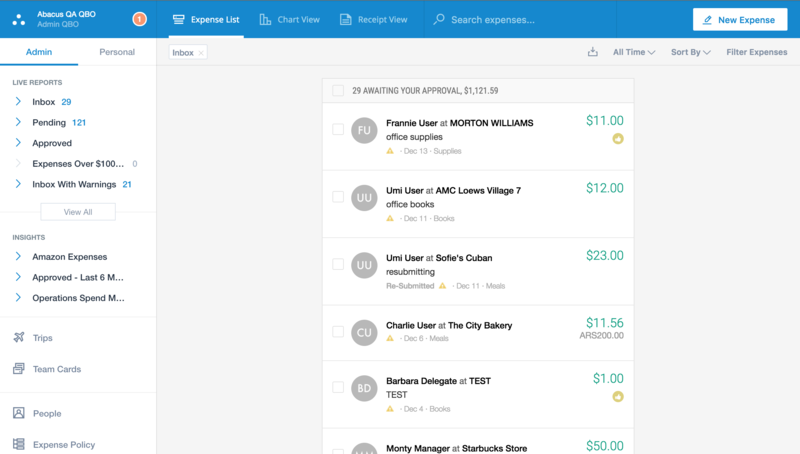 You can invite more than one user at a time by separating email addresses with a comma. There are two additional options when inviting users to your Abacus account. To view them, click "advanced" below the note field. If you would like to invite a user to the account for a temporary amount of time, you can schedule a deactivation date in advance. This comes in handy especially for recruiting candidates who have a certain amount of time to interview on site. At the bottom of the window, you can toggle "no" given the option to send the email invitation now. This will allow you to configure your Abacus account before new users join. 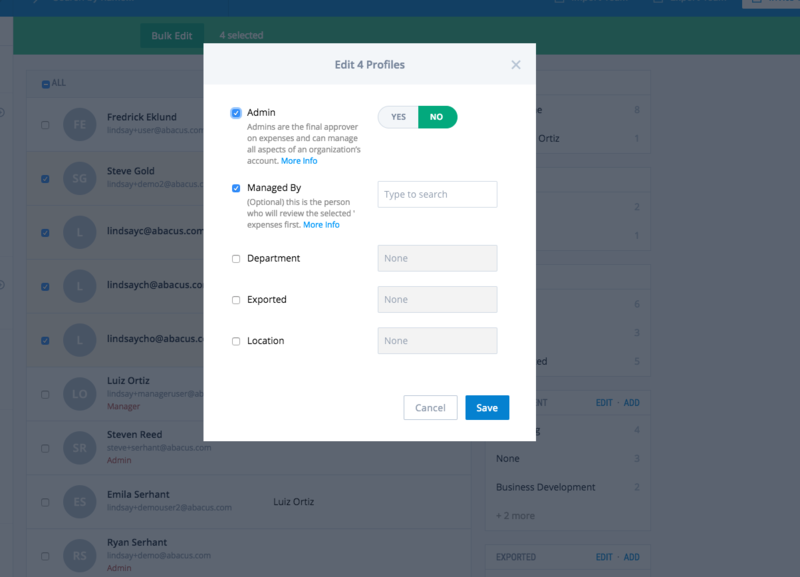 This comes in handy particularly during account configuration - you can set up manager relationships, departments, and rules prior to employees setting up their accounts. 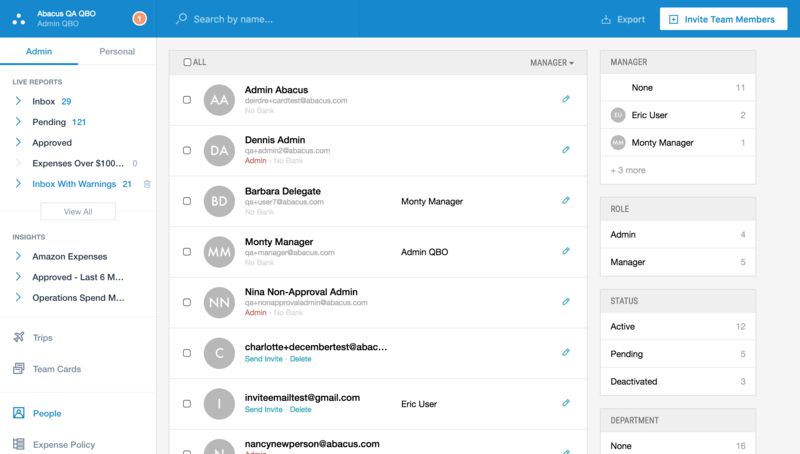 Once your team members set up their individual accounts, they will appear on the People page. 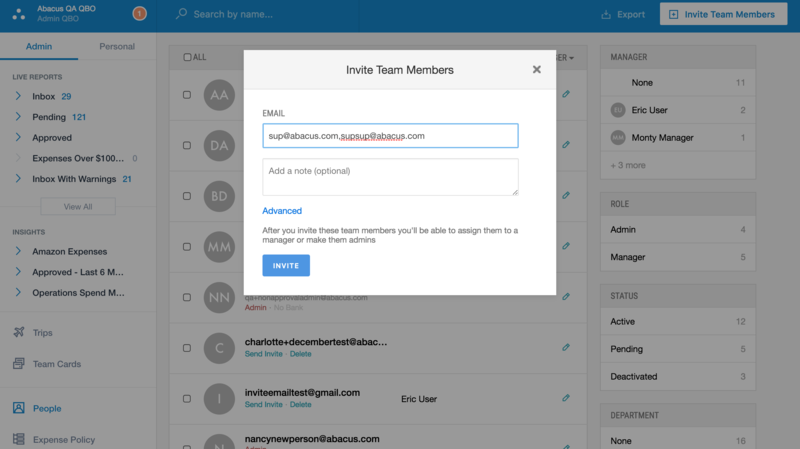 You can scroll through the different Team Fields (such as Department, Group, or Location) to sort through your users. Learn more about Team Fields. Click the pencil icon next to someone's name to view their profile settings, assign them a role as an admin or manager, and edit their Team Fields. Learn more about the difference between admins and managers here. Learn more about Team Fields here. You can select multiple people before performing a particular action. 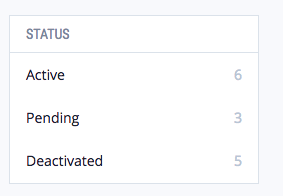 This includes granting admin status, assigning or changing managers, deactivating accounts, or editing Team Fields. After selecting team mates, click on the pencil icon to take the desired action on that group of people. Deactivating an employee in Abacus means that they can no longer log into their account. However, if they have outstanding expenses, they can still be paid out so long as there is still a bank account connected. You can always re-activate an account!